British Virgin Islands is a well-regulated and very popular jurisdiction where companies are being formed and managed in large numbers for all manner of international business purposes. It’s an excellent “company” jurisdiction. However, same can not be said about its banking sector. BVI is not a financial centre and does not, in fact, have many banks locally that actually cater to the international business sector. There are just a few, and their offer – in terms of service depth and quality – is rather unimpressive. In this respect, BVI is no match to the large renowned financial centres such as Switzerland or Hong Kong. 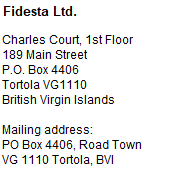 It is possible to open a local bank account in BVI for a BVI Business Company, but it might not be the best option. Many owners of offshore companies tend to operate the companies directly by themselves and open the offshore accounts independently, in a location and with bankers that they may already be familiar with. However, this “DIY” approach poses severe risks to the owner, in terms of potential personal tax liability and undesired scrutiny. The beneficial owners should be aware that opening and managing the bank account in their own country makes the company taxable in that country and it should be avoided if the beneficial owner intends to optimize taxes. (see our Company Management section for a more detailed explanation of those risks). As a separate service, we offer bank account introductions in several offshore jurisdictions, including prestigious financial centres. The actual choice of banks will heavily depend on client’s business profile and financial standing. Following are general guidelines for account opening for an offshore company. The company formation and bank account opening are two different services. Generally speaking, offshore company formation is easy. Opening a decent bank account for the same company is not. It can be incredibly difficult, time-consuming and frustrating. We live in a very regulated world. To open the account for an offshore company, all banks will require very detailed personal and business information from the owners and controllers of the offshore account. In particular, the bank will need to know and identify the actual beneficial owner(s) of the offshore company. All such persons, as well as everyone who will be granted account signatory rights, will have to provide a number of documents - such as certified passport copy, proof of address (utility bill or bank account statement), bankers and/or professional reference and detailed business description/plan. These documentary requirements vary, depending on the chosen bank. This is required by the laws that regulate banking industry. In many banks account opening through an approved intermediary (like us) is still often possible without personal appearance of the owner of the company in the bank, however most banks do require personal visit of the beneficial owner before the account opening - or shortly after. Please note that the bank account introduction fee, as quoted in our fees schedule, is not a fee payable for a bank account opening. Payment of this fee does not guarantee the opening of the account. As the name suggests, the account introduction fee is payable for a professional service rendered by us during the introduction of a client to a particular bank. In particular, this service includes the provision of and the assistance with the completion of bank account application forms, preparation of the company documents for the bank, support and advice during the compiling of the client due diligence information and documents and assistance with submission of the account opening application file to the bank. Using our service usually significantly increases the chances of a positive result, however, we cannot and we do not guarantee the success of the account opening. The success of a bank account opening for an offshore company is mostly dependent on the particulars of the client himself and his business. Properly certified identification documents according to the requirements of the bank, detailed business description with logical information and realistic cash flow forecasts as well as a detailed CV of the company owner showing experience in the area of the intended business are essential for account opening. These documents must be prepared by the client himself as this information depends and is known only to the client and we cannot create it for the client. Banks routinely reject new clients based on their internal considerations and their new client acceptance guidelines if they find the individuals involved in the company are questionable or the business model is unclear or unrealistic. Given the ever-increasing compliance costs, the banks also evaluate any prospective customer in terms of its costs and risks versus benefit. The perceived bank’s risk from a locally operated, locally owned domestic business is usually low. That’s why the neighborhood bakery or mom-and-pop grocery store will find no problem in opening a bank account in the always-friendly local bank branch. When You go offshore – everything changes! By definition, an “offshore” client will always be considered high-risk. From the bank’s perspective this means that the overhead cost to maintain the file of such client will be higher, and the compliance procedures for such client will need to be more frequent, thus more costly. This can only be justified for high-value clients. This is something not widely understood. Many people still think that by applying for a plain bank account they are doing a “favor” to the bank. Nothing can be further from the truth – especially with offshore accounts. Long-gone are days when the bank needed your deposit. They don’t. Most banks nowadays have access to infinite and extremely cheap financing from the central banks and the money-market, where all the large institutional money resides. Unless You come with at least a decent six-figure number, banks generally don’t need your money. They can get more of it elsewhere, cheaper and with less trouble. Banks are not interested to simply keep small amounts of money on current account with little or no movement. Especially, if that current account belongs to a high-risk customer such as an offshore company. It’s simply not worth the trouble and the risk. Keep in mind, bank will also suspect that You are a potential money-launderer until You prove otherwise. Banks don’t earn on plain tiny balances on current account. It’s just a liability for them. Bank’s earn on value-added services. Ideally – asset management, financial instruments, securities. That’s reserved only for the large private banks and only for the wealthy customers with “lazy” money. If not that, at least credit cards, merchant services, frequent payments, foreign exchange, trade financing – any service which is itemized in the bank’s pricelist. If the bank won’t see how it will make profit on your account, why should it even bother? Which all goes to say that your expectations should be commensurate with your abilities. While we apply all possible effort to determine in advance whether a particular client might be accepted by a bank and to prepare all the documents and information as suitable as possible for the bank, this does not in any way guarantee the success of the account opening. According to international agreements and banking industry regulations, the banks are required to provide financial account information about the companies and their beneficial owners in two cases – regarding tax matters and in cases of criminal investigation. Regarding tax matters the information is shared automatically to the tax authorities of the country where the beneficial owner of the company resides. Information sharing is required and regulated by FATCA regulations regarding beneficial owners of the USA and CRS regarding the beneficial owners of the countries that have committed to the CRS. Information is provided only to the tax authorities of the respective country and only for tax purposes. No other information is provided to any other government institutions and no information is provided about the residents of the countries that are not committed. More information about FATCA and CRS can be found on the websites if the respective Authorities. Regarding criminal matters, the confidential information on a banks' client may only be divulged under a proper criminal investigation to the respective police authority. Otherwise the information is strongly protected by the banking regulations and cannot be disclosed to any persons, authorities (other than police or tax authorities according to strict procedures) or any other third parties under any circumstances. Severe financial and criminal penalties await anyone, who divulges such information. When corporate or individual directorship services are provided by us (Fidelity), we are to sign as either joint signatory or sole signatory on all of the company’s bank accounts. This is in-line with the prudent corporate governance requirements which are part of the applicable BVI regulations. The directors are seen to run the day to day affairs of the Company and can be held liable for money laundering, drug trafficking, terrorist financing and mis-management of Company funds just to name a few. Apart from the usual fixed responsibility fees for providing board membership positions, we will also charge an annual fee for acting as authorized signatory on each bank account. A fee for the execution of any transfer instruction will also be charged, unless agreed otherwise.